I know that most of the players who will try to get the Realm First! Illustrious Miner achievement are beta players. For those of you who weren't lucky enough to get a beta key, I made a guide which can help you to get this achievement. The mining routes on the maps are also the best routes to farm the ores on the first day when Cataclysm launches. First, you need to have a mining skill of 450, that's pretty obvious for everyone I guess. It's also important to have the following enchant: [Formula: Enchant Gloves - Advanced Mining]. You need the enchant because you can leave Mount Hyal earlier this way at 470, and you will be able to mine Pyrite Deposit at 520 and Rich Elementium Vein at 495. You will need to learn the [Flight Master's License], which allows you to ride flying mounts in Eastern Kingdoms and Kalimdor. I'd say a 310% flying mount is also a must have. Mobs in Cataclysm have a lot more HP than they had in WotLK, in Mount Hyal if you pull aggro from a level 81 mob and you are trying to get this achievement with some fresh level 80 alt in green gear, it's most likely that you will almost die from the mob and if not, you will be at 20% HP. This will really slow you down, that's why I recommend you to try to get this achievement with a character that have a decent gear. In Twilight Highlands, mobs have more than 100.000 HP and they hit really hard. They will kill you. It is absolutely important to not try to mine any nodes until you are certain that you won't pull aggro, fortunately the mining route I recommend in Twilight Highlands is pretty secure, in some places there aren't even any mobs and half of the places have neutral mobs and they won't attack you. Before you start, turn on NPC names and also enemy name plates! 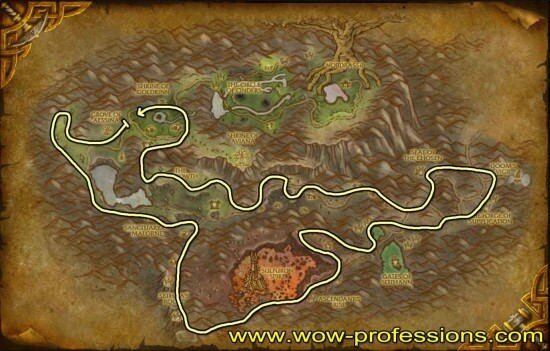 This will help you to spot if there are too many mobs around a node and it's not safe to land there, specially when you are in Twilight Highlands. 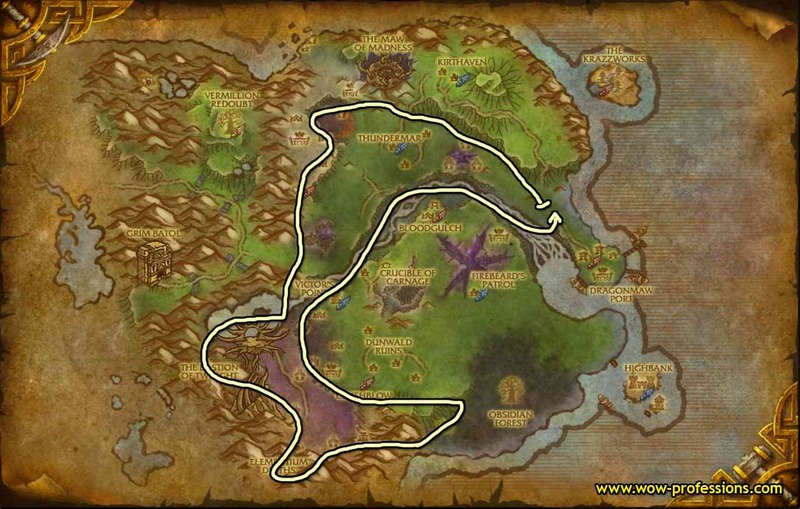 There are only two zones where you can find Obsidium, Mount Hyal and Vashj'ir. In Vashj'ir, every Obsidium Ore is underwater which means when you farm, mobs can attack you from below and from above you. This can get really frustrating after a while, that's why I recommend Mount Hyal instead, I also found more Obsidium in Hyal than in Vashj'ir. Not to mention that you have to complete a quest line to get your underwater mount in Vashj'ir. Mount Hyal is really a no brainer choice, or you can go to Icecrown since there will be no competition there at all. 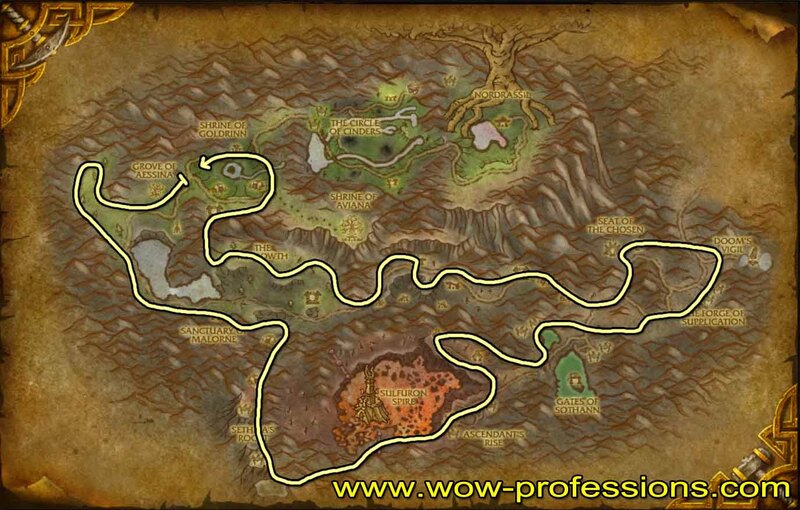 As soon as you reach 470 (assuming you have the enchant on your gloves), head to Twilight Highlands. Elementium Ore is a lot more common there than Obsidium Ore in Mount Hyal. Deepholm would be the best place, but you can't acces Deepholm until level 82. These maps will be used in my mining guide when Cataclysm launches, because as I mentioned the routes are really good farming routes. That's it, I hope it will help some of you to get the achievement!